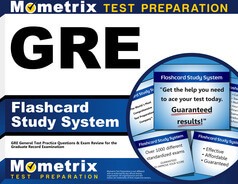 Welcome to Mometrix Academy’s GRE review page. This page serves as a convenient resource that will allow you to find all the information you need about the GRE test in one place instead of hunting through multiple websites. We also offer GRE practice test questions and tutorial videos that will help prepare you for the test. If you think you already have all the information you need about the GRE, you may start watching the videos right away or take our free GRE sample questions. If you need to know more, read the whole page to learn everything you need and then watch the GRE prep course. Mometrix Academy is a completely free GRE test online resource provided by Mometrix Test Preparation. If you find benefit from our practice GRE efforts here, check out our premium quality GRE study guide to take your studying to the next level. Just click the GRE study guide link below. Your purchase also helps us make even more great, free content for test-takers. The GRE (Graduate Record Examinations) is an admissions examination for many graduate program fields; it is usually taken by undergraduate seniors or college graduates who are applying to some sort of graduate program. It was established in 1949 and initially focused on quantitative and verbal reasoning, but as the needs of graduate programs have changed over the years, the content of the GRE has changed as well. In 2011, the GRE received a major overhaul and was renamed the GRE revised General Test. The new GRE measures the three primary skill areas (Analytical Writing, Verbal Reasoning, and Quantitative Reasoning) in a way that aligns more closely with the skill set needed to succeed in graduate education, making it easier to determine each candidate’s performance level. The GRE revised General Test is generally taken by prospective graduates and business school applicants who are thinking of attaining a master’s, MBA, specialized master’s in business, or a doctoral degree. Applicants tend to have varied educational and cultural backgrounds, so the GRE test is designed to provide some common measure for comparing their qualifications. The GRE is accepted by thousands of graduate and business schools and their divisions. Most candidates take the computer adaptive form of the test, though there a few paper-and-pencil test sessions offered each year. The test is offered throughout the year at Prometric test centers for a fee of $50. The GRE test has five sections that last half an hour each; in total, the test takes about three hours and forty-five minutes. There are three question types: Verbal Reasoning, Quantitative Reasoning, and Analytical writing. The GRE contains two Verbal Reasoning sections, two Quantitative Reasoning sections, and one Analytical Writing Section (unless you’re taking the pencil-and-paper test, in which case there are two Analytical Writing Sections). All questions in the Quantitative Reasoning and Verbal Reasoning sections are multiple-choice. The new GRE is computer adaptive; depending on your performance, the difficulty of your test may increase or decrease as you go on. The test starts with a section judged to be of medium difficulty, and depending on your performance, the next section may be easier or harder. If you do well in the first math section, the second math section will be harder; conversely, if you do poorly on the first section, the second section will be easy. Of course, the algorithm for doing well or poorly is a little imprecise, but suffice to say that the fewer questions you miss, the more likely you are to get more difficult sections. Remember: getting the easy section means limiting how high you can score, so you want to aim for the more difficult sections. It is important to note that you can skip questions and come back to them later if you have time; this is something that was added in the new GRE. You only have an allotted amount of time for each section, but you can use that time to work on that section however you wish. You may skip as many questions as you like, but it is recommended that you only skip harder questions so you can return to them later; that way, you won’t waste too much time on the harder questions and will ultimately be able to answer more questions. Each question scores the same amount of points, so there’s no reason to waste time on harder questions. Also note that there’s no penalty for wrong answers on the GRE; you are free to answer the questions in any order, but you should definitely try to answer every question, even if this sometimes means taking a wild guess. The Verbal Reasoning section of the GRE test requires you to be able to recognize the meaning behind obscure words in the context of elaborately-constructed sentences. There are three types of questions in this section. The first is Text Completion, or TC, which refers to fill-in-the-blank sentences. You must fill in the blank with the correct vocabulary word; however, some sentences may have multiple blanks, and some questions may ask you to fill in blanks spread out over an entire paragraph. The second type of question is Sentence Equivalence, or SE, where you must choose two words that would both logically complete the sentence (no partial credit, unfortunately). The final type of question, Reading Comprehension, or RC (which makes up half of the Verbal Reasoning section), deals with specific reading passages, which can be fewer than 100 words or as long as 450 words. The passages cover topics from multiples fields, such as science, literary critique, and social sciences. You should at least be familiar enough with these subjects to understand the questions being asked. Each Verbal Reasoning section contains twenty questions, half being TC and SE questions, and the other half being RC questions. The test always begins with six TC questions that are followed by the reading passages, with SE being distributed throughout. One strategy for dealing with Verbal Reasoning questions is to refrain from immediately reading the answer choices after reading the questions; many of the wrong answers are designed to “sound” right, and looking at the answers before thinking over the question can lead to jumping to conclusions. Cover up the answers with your hand and think over the sentence carefully to decide which word would best fit the blank. Only circle an answer once you have given the matter serious independent thought. For RC questions, reread the passage as soon as you read the question; focus on the passage that best answers the question, and then put the answer in your own words. Afterwards, circle the answer that best matches what you were thinking. The vocabulary words on the test are drawn from a bank of 5,000 words that are considered sophisticated, scholarly, or academic, such as the vocabulary found in a prestigious newspaper or an academic paper. The new GRE places less emphasis on knowing the definitions of words. It’s more important that you recognize how to use the words in a sentence. You may use flash cards to learn the definitions of words, but in order to truly learn how the words are used, reading words in-context and looking up their definitions creates more neural connections. A good resource for learning the vocabulary in the GRE would be a newspaper such as the New York Times or The Economist. For some people, the challenge of Reading Comprehension may lie in the passage; others are challenged by the wording of the answer choices. When reading the passages, try to make mini-paragraph summaries in your head so that you can understand the main points. As with the other multiple choice sections, do not immediately look at the RC section. You can improve at Reading Comprehension by becoming accustomed to reading dense, difficult passages from the New York Times and similar publications. Remember, every GRE practice question is worth the same on the exam. If you’ve spent over a minute on a question without making progress, you may want to skip over it at first in order to answer some easier questions. Some GRE practice questions will take less time than others. SE questions tend to take the least time to answer, while Paragraph Arguments and long reading passages tend to take the most time. Also, remember the typical difficulty order of GRE questions. The triple-blank questions that will take you the most time are usually the fifth or sixth questions. One final thing to note is that in the Reading Comprehension section, there’s a fourth question type called Paragraph Argument. Each paragraph has one question that asks you to evaluate the logic of the paragraph. These questions can be tough and time consuming; it is recommended you look at some sample questions in order to get a feel of what you need to do. Fortunately, the GRE does not deal with higher level math such as calculus, trigonometry, and geometry proofs. Instead, it deals with high-school level subjects such as basic properties of shapes (i.e. circles), integer properties, exponents, and word problems dealing with rate questions and probability. The math itself isn’t that difficult; the real challenge is figuring out what the question is asking you to calculate. Showing your work is less important than picking the correct answer. While the GRE does test your ability to deal with number properties and geometric figures (which you should definitely familiarize yourself with), the real purpose of the Quantitative Reasoning section is to test the way you solve problems. Essentially, it tests your ability to reason with numbers. The math section is divided in Problem Solving questions and Quantitative Comparison. The section will always begin with seven or eight Quantitative Comparison questions, where you compare two columns (A and B) to determine which is bigger. The Problem Solving section will contain multiple-choice questions, multiple-answer questions, and Numeric Entry questions (that final type of question is not multiple choice; you must type the answer into a box). The most common math concept on the test is word problems, followed by algebra, percentages/fractions/ratios, data interpretation, and geometry. There are also questions about statistics and exponents. Less common are questions about probability, coordinate geometry, and arithmetic series. The GRE questions are designed to be confusing. It is easy to misinterpret the questions and come to a completely wrong conclusion. Be cautious if you think a question is too easy. You can also use estimation to help you hone in on the correct answers. Of course, the best way to prepare yourself for Quantitative Reasoning is to learn mathematic strategies and then apply them to increasingly difficult problems. It is worth noting that you are allowed to use the on-screen calculator for the GRE test; you are also allowed a calculator for the written version of the test. Remember, for the computer version of the test, you can save time by typing in numbers. However, you should not always rely on a calculator when you are pressed for time; there’s a risk of entering the wrong numbers. Being able to estimate and perform mental math helps save time. Also, you will be allowed to use an unlimited amount of scratch paper. Remember, every math question is weighed the same. It is perfectly acceptable to initially skip questions depending on your weak areas. There’s no penalty for wrong answers, so be sure to answer every question, but don’t worry about being able to solve each one. The Analytical Writing Assessment (AWA) is the essay portion of the test and is comprised of two 30-minute essays: the Issue and the Argument. In both essays, you put forth a thesis statement and defend it over the course of the essay. The Issue essay requires you to respond to and analyze a general statement relating to politics, education, or culture; basically, it asks you to take a stand on the issue. The Argument Essay simply asks you to dissect the logic behind the presented argument. The Argument question tends to be a paragraph, while the Issue question tends to be a single sentence. All students should study the same national curriculum until college. Write a response in which you discuss the extent to which you agree or disagree with the recommendation and explain your reasoning for the position you take. In developing and supporting your position, describe specific circumstances in which adopting the recommendation would or would not be advantageous and explain how these examples shape your position. The following is a recommendation from the Board of Directors at a bookstore. We recommend that this bookstore open a café. This bookstore has been in business for over twenty years and has a large customer base due to its wide selection of books. Opening the café would obviously attract more customers. We could open space for the café by closing the children’s book section, which will most likely become less profitable due to a recent national census showing a significant decline in the population under age ten. Opening a café will allow our store to attract more customers and compete with rival bookstores that recently opened their own cafes. Write a response in which you discuss what questions would need to be answered in order to decide whether the recommendation is likely to have the predicted result. Be sure to explain how the answers to these questions would help to evaluate the recommendation. The essays are typically scored by university literature/writing professors. However, in recent times, ETS has developed an “E-Rater”, an automated essay grader. This does not replace the human essay grader; rather, it ensures that the human grader is paying attention to their job. If the E-Rater’s score differs by one point or more, it is sent to another human grader. The final score is the average of your two essays rounded up to .5. The graders are looking for clarity, coherency, and cogency. In other words, your ideas must be expressed in a clear manner with the ideas logically connected and backed up by convincing evidence. Style is important as well; your sentences should be well-written and use sophisticated vocabulary. You must also pay attention to proper grammar; a couple of mistakes won’t impact your score all that much as long as the rest of the essay is well-done, but the grader will notice if you make too many mistakes, and it will negatively impact your score. Longer essays tend to score higher than shorter ones (although substance definitely matters). It is recommended that your essay consist of at least five paragraphs: an intro, three body paragraphs, and a conclusion. Write: Hone your writing skills to make it easier to facilitate your writing skills upon demand. Outline and brainstorm your ideas: Don’t start writing before your logic and your examples have fully formed. Spend a few minutes creating a roadmap. Once you develop this skill, it becomes an efficient way to write an essay. Edit your practice essays: Become more aware of the grammatical and logical mistakes you tend to make so you can anticipate them later on. Read sample essays: Read our sample student essays in order to get a feel for what is expected of you on the GRE. Improve your grammar: While the ideas behind your essay are most important, it is important to follow grammatical rules in order to communicate your ideas. You should also pay attention to the writing style and adapt your writing style accordingly. It is important that you get plenty of rest the night before the test. DO NOT plan on cramming the night before. Make sure you work on plenty of GRE practice test questions in the weeks leading up to your test. The sheer amount of knowledge needed for the GRE is built up over several months of studying. A few GRE practice test questions the day before won’t hurt, but you should be as relaxed as possible. You’ll need to bring a valid I.D. in order to take the test; it would also be a good idea to bring some snacks along the lines of nuts, dates, and bananas—natural foods with plenty of calories. The test will take around four hours; this time includes check-in and background questions. Remember: the test is divided into two 30-minute essays and five math/verbal sections (plus an experimental section). You will have a 10-minute break after the third section and one-minute breaks between the other sections. You may take a break on your own at any time, but remember that you only have a limited amount of time. A good GRE test score is somewhat relative. Last year, applicants to the top 10 Engineering programs had an average quantitative score of 165 (around 90%), while those admitted to the top 10 Education programs had an average of 156.6 (64%). Scoring around 50% is about average; it probably won’t help you much, but it’s not going to particularly hurt you either. A score around the 25% mark might be a bit more detrimental to your application. Ideally, a score around 75% will help you stand out as a competitive candidate. Remember: a GRE score is only part of your application. Even a perfect score doesn’t guarantee acceptance by high-ranking schools. Check the average scores of the school you’re applying to in order to figure out what your goal for the GRE should be. Depending on your goal, you may have more or less room to skip questions. Assuming your goal is about 160 on each section, you could miss over a dozen questions in verbal and 8-9 in math. You’ll receive a score on a range of 130-170 the day of the test. At the very end of the test, a window will pop up and ask if you want to see your scores; remember, if you click no, then not only will you not receive your score, your score will subsequently not be sent to your selected schools. Your essay scores should be available in about two weeks and should be available through your GRE account. Your score will be valid for up to five years. You can take the test as many times as you’d like; if you choose not to send your scores to any schools, you can ignore the results of your first GRE and try again later. (If you decide later that you do want to send that day’s score, it will cost a fee.) You may take the GRE as many times as you can afford. You may want to retake it if your score is far below the average for the program you’re aiming for, if you feel your application isn’t strong enough to send in an average score, if you feel like you’ve improved since your last attempt, or if you panicked during your test and feel you could do better next time. Remember: the GRE is an important part of your application, but it does not guarantee your acceptance. Mometrix Academy is a completely free resource provided by Mometrix Test Preparation. If you find benefit from our efforts here, check out our premium quality GRE study guide to take your studying to the next level. 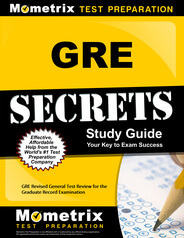 Just click the GRE study guide link below. Your purchase also helps us make even more great, free content for test-takers.